MEMS Micromachining has been a key capability at Micralyne for over 25 years. We are experts in micromachining, including surface micromachining and bulk micromachining of silicon. 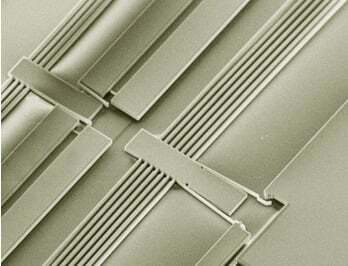 MEMS micromachining involves the selective etching of silicon, glass, and deposited thin films to form three dimensional mechanical structures such as cantilevers, diaphragms, and channels. Micralyne has developed cutting edge processes that cover lithography, materials deposition, high aspect ratio etching (DRIE), wafer bonding, testing and packaging to put a finished device in your hands. Surface micromachining involves building up layers on the surface of the substrate, using low-stress films such as oxide and nitride while etching out the sacrificial layer, such as amorphous silicon. Bulk micromachining involves etching away the bulk of the silicon wafer to create the desired microstructures. Silicon etching is done using either a dry etch (DRIE) or a wet etch (KOH or TMAH) for more of an anisotropic etch. We can also post process CMOS wafers, which integrate circuitry with MEMS technology. What kinds of MEMS micromachining devices have we created?